The girls Competitive Programs at Wayland Sports vary slightly from location to location but generally the programs are made up of 20-30 athletes who each train between 6 to 16 hours per week. Competitive gymnastics training focuses on conditioning (increasing muscular strength, muscular endurance and cardiovascular fitness), stretching/flexibility, and the perfection of skills required for routines. All competitive athletes will learn routines on the Olympic Artistic apparatus: vault, bars, beam and floor. Competition season runs from late January to June. The girls will compete at 4-5 local competitions and then Zone Championships and Provincial Championships if they qualify. We will work hard during training to prepare both physically and mentally for the competitive environment. Athletes will compete against other girls in their same age category. Competitors will be from various gymnastics clubs from all over B.C. and the Lower Mainland. Athletes will perform in front of a panel of judges who will determine their score based on perfection, execution and difficulty. The judges follow strict guidelines from the British Columbia Women’s Artistic Gymnastics Code of Points. The decision to join our team is a big one and reflects a significant 11-month family commitment. There are 10 months of regular season training with fees due on the last business day of each month and then 2 months of flexible summer training in July and August. Participating in competitive sport has many benefits that will last a lifetime. 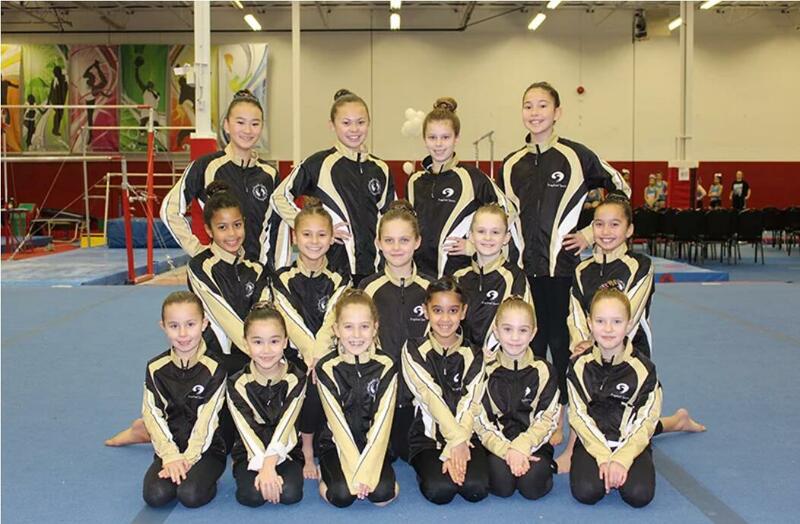 Gymnastics BC introduced the Junior Olympic (JO) Training Program to our province in 2014. The JO program was created in the US and has been adopted by many Canadian provinces. With 10 levels of participation, the JO program offers even more opportunities for our athletes to experience the thrill and challenge of competitive gymnastics. We are exited to announce our newest addition to our programming in Richmond! 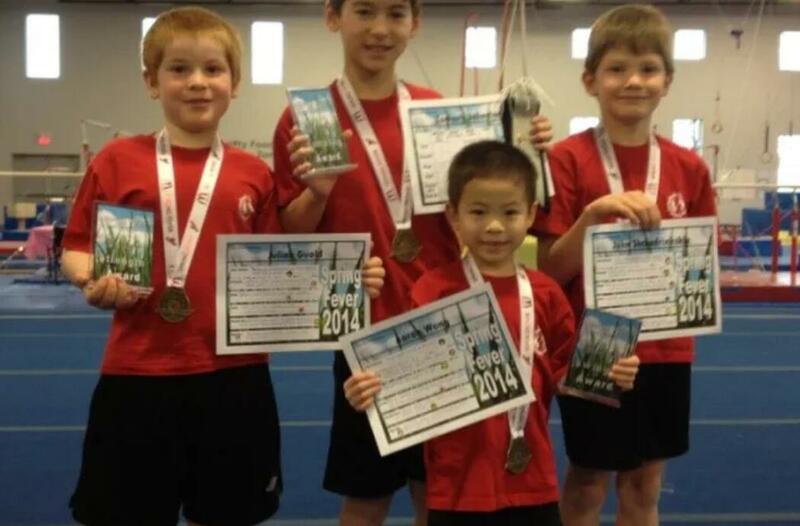 The boys competitive artistic gymnastics program! Our program is made up of 20-30 athletes who each train between 6 to 16 hours per week. Competitive gymnastics training focuses on conditioning (increasing muscular strength, muscular endurance and cardiovascular fitness), stretching/flexibility, and the perfection of skills required for routines. All competitive athletes will learn routines on the Olympic Artistic apparatus: Floor exercise, pommel horse, still rings, vault, parallel bars and high bar. Competition season runs from late January to June. The boys will compete at 4-5 local competitions and then Zone Championships and Provincial Championships if they qualify. We will work hard during training to prepare both physically and mentally for the competitive environment. Athletes will compete against other boys in their same age category. Competitors will be from various gymnastics clubs from all over B.C. and the Lower Mainland. Athletes will perform in front of a panel of judges who will determine their score based on perfection, execution and difficulty. The judges follow strict guidelines from the British Columbia Men’s Artistic Gymnastics Code of Points. The decision to join our team is a big one and reflects a significant 12-month family commitment. There are 10 months of regular season training with fees due on the last business day of each month and then 2 months of flexible summer training in July and August. Participating in competitive sport has many benefits that will last a lifetime. For more information about our boys competitive program at our Ironwood location please contact our Richmond location office located in Irowood at 604-275-1888 or richmondinfo@waylandsports.com.